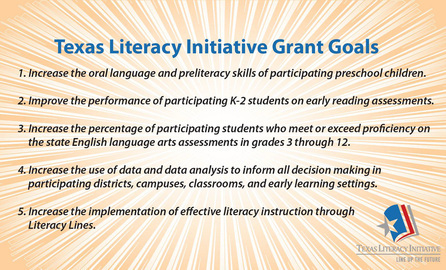 The purpose of the Texas Literacy Initiative (TLI) grant is to improve school readiness and success in the areas of language and literacy for disadvantaged students in targeted school districts, including their associated Early Childhood Education ECE providers, who will use the model of Literacy Lines to implement the Texas State Literacy Plan (TSLP). The goal of the Texas State Literacy Plan (TSLP) is to ensure that every Texas child is strategically prepared for the literacy demands of college or career by high school graduation. To achieve this goal, the plan centers on early language and preliteracy skills for age 0 to school entry and on reading and writing instruction for students in grades K-12. The plan is organized into six components: Leadership, Assessment, Standards-based Instruction, Effective Instructional Framework, Reporting and Accountability, & Sustainability.